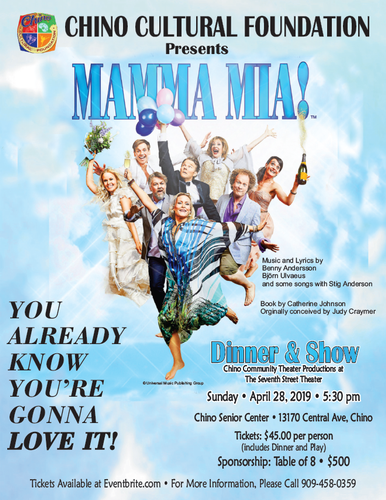 The Chino Cultural Foundation hosts Dinner & A Show in conjunction with the Seventh Street Chino Community Theater. Dinner will be served from 5:30 pm - 6:45 pm. Dessert will be served at intermission. Dinner is served at the Chino Senior Center and then a short walk to the Theater. Seating is limited and seating is assigned by the theater. Please call: 909-458-0359 to make reservations.